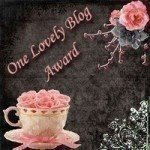 I've been awarded with the 'One Lovely Blog' award by Avery James Photography! This is a photography blog written by one of my dearest friends :) I'm very thankful to have been chosen as one of her favorite daily reads! 1. Accept the award, post it on your blog together with the name of the person who has granted the award, and his or her blog link. 2. Pass the award to 15 other blogs that you've newly discovered. Remember to contact the bloggers to let them know they have been chosen for this award. It is true: Your blog is beautiful, interesting, and has a great consistency of tone. I like it. thank you very much for this special award :) i appreciate it very much! Thanks Jen, I love awards, apparently I was such a failure at school no one gave me one. Thanks again for the award Jen. hiya there! i accidentally deleted the email you sent. by the looks of it, you figured out the questions you had. it looks really great! i promise not to delete any emails you send in the future...and i welcome emails and questions. Congrats, Jen :) I'm new in blogging and I like your blog! Ahh, well done. You deserve it. Gorgeous blog! I love the ones you have chosen to pass it on to. Some are my favourites too and many new discoveries. Hey! We didn't win =( I thought Mungo Jerry would make us a shoe in. Jen! Well I have got to say I am honored...and to be in such good company. Frankly I am tickled Pink! Thank you so much, Jen! You're the sweetest ever! For serious.